Based on the Temple Law School model, the LL.M. in Trial Advocacy provides training in trial advocacy and litigation strategy using a “learn by doing” approach. The program kicks off with “Bootcamp,” an intensive two-part program focusing on the art of advocacy and speechmaking. As the title suggests, we believe a critical front-end indoctrination into courtroom skills allows students to successfully navigate the future rigors of the program and the courtroom. Students are exposed to Temple Law’s core philosophy of teaching: Translating theory into courtroom performance. Case theory lies at the heart of trial advocacy. Bootcamp offers students a series of seminars and performances designed to deepen theoretical knowledge. By the end of Bootcamp students will have learned to prepare the witness, deliver convincing direct examinations, effectively cross-examine, raise and overcome evidentiary objections, and select strong facts to persuasively present to judge and jury. 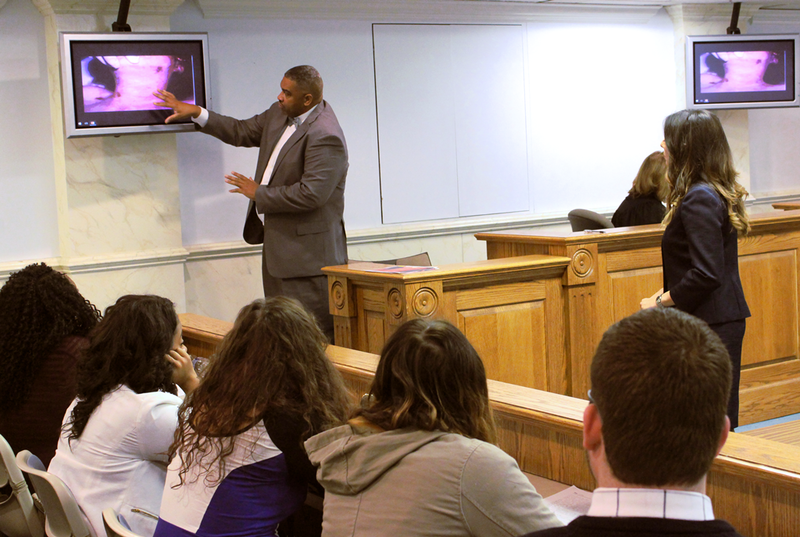 Each student tries a variety of civil and criminal cases throughout the year in bench and jury trial formats. LL.M. course offerings culminate in a series of spring semester trials. Students apply their knowledge of foundation curricula: litigation strategy, motions, depositions, expert testimony, jury dynamics, and courtroom technology to present compelling arguments to judges and jurors. Experienced litigators and respected judges preside over the trials, providing individual critiques with each performance. Valuable feedback is also provided by jurors. Students perfect their craft by viewing their own video-recorded performances and trials. The completion of written self critiques allows students to self correct and fine-tune their personal styles and advocacy skills. The LL.M. in Trial Advocacy kicks off in the summer session with an intensive two-part “Bootcamp.” As the program title suggests, we believe a critical front-end indoctrination into courtroom skills allows students to successfully navigate the future rigors of the program. Bootcamp exposes students to Temple Law’s core philosophy of teaching: Translating theory to courtroom performance. Case theory lies at the heart of trial advocacy, and the initial Bootcamp program offers students a series of seminars and workshops designed to deepen theoretical knowledge and refine its conversion to improved trial skills. By the end of their Bootcamp experience students will have learned to: prepare a witness, present convincing direct examinations, and effectively cross-examine the opposition; perform an intense review of evidence law and refine their ability to raise and overcome objections; and select the strongest facts from their case and persuasively communicate them to the jury. Students learn to prepare a witness, present convincing direct examinations, and effectively cross-examine the opposition. Through a series of simulated cases, students develop sophisticated questioning skills under the direct supervision of our esteemed faculty. The Art of Advocacy component includes group sessions, individual performance, and faculty demonstrations to further develop winning trial techniques. In this segment, students quickly learn the powerful simplicity of evidence: the only persuasive evidence is that which the jury hears. Students perform an intense review of evidence law and refine their ability to raise and overcome objections. The curriculum translates classroom lectures into practical exercises, where the rules of evidence turn from impediment to advantage. Students learn to select the strongest facts from their case and persuasively communicate them to the jury. This component, designed by Herbert F. Kolsby of Kolsby, Gordon, Robin & Shore and Director Emeritus of the LL.M. in Trial Advocacy, concentrates on opening statements and closing arguments. This component emphasizes effective liability summation and damage presentation. Employing a unique inter-disciplinary approach, renowned faculty litigators and speech experts combine years of courtroom experience with empirical research on juror attitudes and psychology. 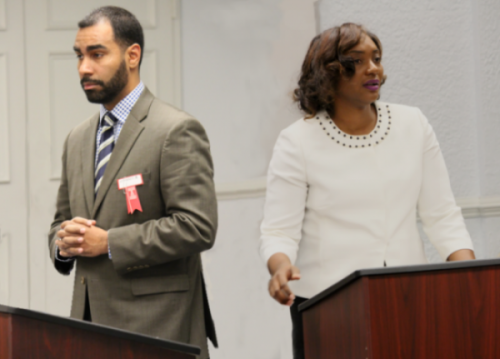 Students gain valuable insights to their nonverbal communication while also perfecting oratory courtroom skills. Deposition remains one of the most underdeveloped disciplines for trial attorneys. Temple’s LL.M. program teaches students to maximize fact-finding efforts, allowing them to build strong, well-tailored cases. The program offers an integrated approach to deposition that combines interactive lectures with hands-on practice. Howard Bruce Klein, a national authority (author, THE DEPOSITION GUIDEBOOK (ALI-ABA 2007)), instructs students in all aspects of deposition practice. Students gain an appreciation for the critical role of deposition preparation and performance in litigation by taking and defending both expert and lay depositions. Students learn persuasive pre-trial motions by arguing before regional judges and trial lawyers. In this court room setting, LL.M. lawyers are paired against one another and argue a variety of motions on topics including Discovery, Privilege Logs, Work Product, Lack of Jurisdiction, Summary Judgment, and Preliminary Injunction. Judge instructors render rulings and provide individual feedback on students’ pre-trial performance. To address the significant interplay between litigation and appellate practice, students learn to identify potential appellate issues at the trial stage, and properly preserve those issues through oral and written motions. During this component, experienced appellate practitioners sit as judge instructors and critique students’ oral arguments. During this component, Larry Bendesky of Saltz, Mongeluzzi, Barrett & Bendesky and Director Marian Braccia teach students how to effectively direct and cross-examine experts. The program also highlights evidence law, the gateway to all expert testimony. 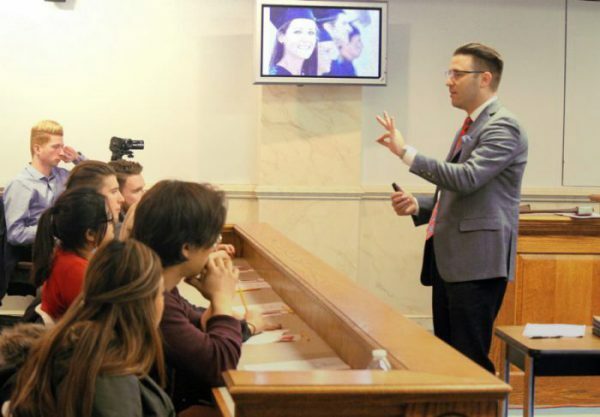 Students are also trained to creatively engage the federal rules of evidence, as well as to successfully argue testimony admittance and exclusion. Students will learn through eliciting testimony from practicing physicians, design engineers, economists and forensic examiners who regularly serve as witnesses in the courtroom. Those interested in criminal law are also offered testimonial access to law enforcement and ballistic experts. Post performance, students have the rare opportunity to obtain individual feedback from the experts. With six distinct topics ranging from case theory to technology, the program directly integrates litigation theory with trial practice. Nationally recognized trial attorneys share their most valued secrets and strategies through lecture, demonstration, and reenactment of their landmark cases. LL.M. students are coached on how to incorporate newly acquired litigation strategies during their trial performances. The cornerstone of the LL.M. in Trial Advocacy is that students “learn by doing,” in other words, by practicing proven techniques during trial presentations before juries. Technology has fast become an integral component to jury persuasion. Although most trial lawyers accept technology on some level, many remain either unaware of its dynamic impact or avoid its inclusion in their practice. Robert Mongeluzzi and Donna Lee Jones (Saltz, Mongeluzzi, Barrett & Bendesky) showcase the power of finely-tuned visual effects in the form of actual demonstrative evidence. Students learn to use technology to capture jury attention and highlight recurring case themes. Students learn to creatively interact with Trial Director, a leading software program for document organization, and photo, video, and testimony presentation. The workshops offer hands-on training for all software components. From case organization through trial presentation, Temple LL.M. provides access to various experts: Temple Law’s IT department; Trial Director specialist Thomas G. Oakes; and jury consultants. Implementing systematic case organization, students create technology-based exhibits for evidence presentation. Temple assembles jury experts, law professors, judges, and jurors to fully immerse students in the jury selection and jury trial process. Students evaluate and are evaluated by potential jurors. Faculty demonstrations and performance workshops teach LL.M. students how to create persuasive energy in the courtroom. Prior to trial, students are coached on asking questions that reveal the jurors’ worldview and predict how he or she will react to case evidence. Post trial, students evaluate their case themes and theories by debriefing jurors and viewing deliberations via closed circuit video technology. Each student will try a variety of civil and criminal cases throughout the year in bench and jury trial formats. LL.M. course offerings culminate in a series of spring semester trials. 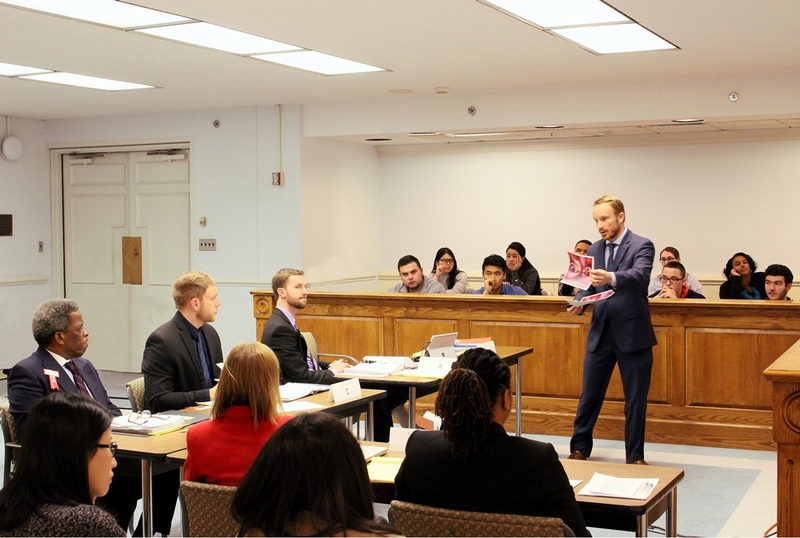 Students apply their knowledge of foundation curricula: litigation strategy, motions, depositions, expert testimony, jury dynamics, and courtroom technology to present compelling arguments to judges and jurors. Experienced litigators and respected judges preside over the trials, providing individual critiques with each performance. Valuable feedback is also provided by jurors. Students perfect their craft by viewing their own video recorded performances and trials. The completion of written self critiques allows students to self-correct and fine-tune their personal styles and advocacy skills.